Got a lot to go over today after Saturday’s scrimmage and yesterday’s media session, so we’ll get right to it. Reports come courtesy of the usual suspects: Andy Bitter, Jay Tate, Charles Goldberg. Two semi-free P-Marsh reports are available here and here. — So Zac Etheridge goes live, finally. Excellent. (His “‘last time I came out here I didn’t walk off the field” quote was probably the best soundbite of fall camp, no?) If Mike McNeil is as healthy as he’s claimed to be–that we haven’t heard anything about him since the beginning of camp is probably a good sign in his case–Etheridge will still have some ground to make up after getting into live action so late … I would think. Then again, the coaches have made it so obvious how much they value Etheridge’s leadership qualities on the field, you know he’ll get every opportunity to his way back into the first 11. My exceedingly uneducated guess is that it’s about 50/50 for Arkansas State, with increasing odds each week following. — And then there were two: despite what Grimes and Chizik are saying, it sounds like it’s down to Sullen and Greene for the right tackle job. It’s a pretty great story either way: “hometown kid who initially got passed over for being too fat slims down, starts as true sophomore” and “little-used ex-defensive end finally overcomes string of injuries, lights up practice, wins first meaningful snaps of career as starting tackle” both jerk on the heartstrings a bit. It’ll be super-easy to root for either guy. But I’ll cop to kind of hoping Sullen takes it (as I think he’s sorta expected to by this point); simply put, getting to put the experience gained at right tackle this season to use for two more years, rather than one, would be a help on what projects to be a couple of very green lines. — Demetruce McNeal turns in another good scrimmage, and the depth chart at safety–a huge worry for most of the offseason–suddenly looks filled to bursting, what with the Savage-McNeil-Etheridge trio on top and McNeal, Cole, and Means all probably capable of stepping in in a pinch … not to mention the possibility of just sliding Bell or Bates back. We really shouldn’t have to worry about finding someone to take care of things back there. Another point regarding McNeal (and Ryan Smith, who’s allegedly done very good work this camp): just in case it wasn’t already obvious after what happened with Bates, this staff knows exactly what they’re doing when it comes to recruiting safeties. — Good: Ladarious Phillips is more than living up to his “yes, he’ll get you two yards on third-and-one” hype, at least in scrimmages. Bad: P-Marsh reported he turned an ankle, meaning we might have to wait until Week 2 or 3 to see him in action. But as much work as he’s gotten in this fall’s scrimmages, it’s clearer than ever he’s going to get carries, and soon. — We got our first news this fall regarding a handful of players: Bart Eddins, who is, in fact, healthy and as a result sounds like the first guard off the bench ; Harris Gaston, who got mentioned by Chizik as having had an excellent scrimmage and may be able to hold off Jake Holland for the backup MLB spot after all, not really surprising when you consider how much raw talent he was reported to have coming out of high school; and Chris Davis, who’s been mentioned here and there by some of his defensive teammates but got his first plaudits from Chizik (if I’m not mistaken) after the scrimmage. I haven’t gotten around to Google surveying him yet, but my sense based on first-hand reports and Davis’s incredible productivity at under-the-radar Woodlawn was that Davis had the goods to be a serious corner and had the highest upside of the high-school-QB-turned-Auburn-DB brigade; so far, so good. — Oh man, how much nicer is it reading chip-on-the-shoulder “we’re not being mentioned as we should be” quotes as opposed those “we know how to handle expectations/we’re not reading our clippings” quotes from ’06 or ’08? Or Ole Miss ’09? Much, much nicer. 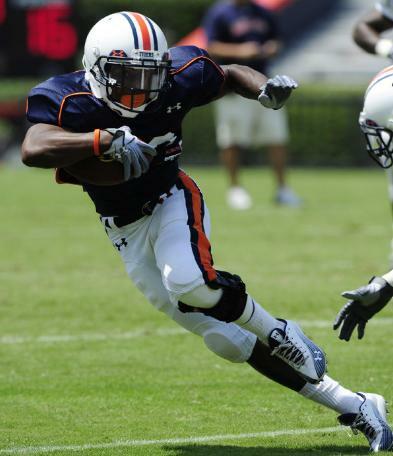 — Tate reports that Trovon Reed is the only freshman wearing a first-team type orange jersey. Marshall says “he will do things on the field that will be remembered at Auburn for a long, long time.” No, I don’t think he’s going to start. But yes, he’s going to be involved. A lot. He’s moved up to “must-see” status (along with Dyer, Phillips, Lemonier, and Whitaker), hasn’t he? — Speaking of Marshall, we still don’t have any real idea who’s going to be the backup–all Dr. Gustav has told us is that he’s happy with them, which means a lot more, I think, than his predecessor’s sunshine-pumping–but P-Marsh did say he expects Trotter to be handed the job. I’m still backing Caudle because I’m a sentimental softie like that, but it’s fair to say that if Caudle hasn’t been able to shake Trotter by now, the coaches will be perfectly justified in going with the younger player. — Evan Woodbery had some interesting quotes from Trooper Taylor about his public “dog-awful” assessment of that one bad practice for his receivers. Apparently some fans e-mailed him, taking him to task for being too harsh on his charges. To which I’d respond: dude, the coach who turned Darvin Adams and Terrell Zachery into arguably the most productive receiving duo in the SEC in the space of one offseason has earned the right to say just about whatever he wants … especially since 94.7 percent of what he offers to the press is unqualified praise. I’d feel a little uncomfortable about those kinds of comments after a game, but after practice? Dog ’em out all you want, coach. Some fans ought to have better things to do with their time. And lastly, an announcement. I’m home after last week’s travels and will be through the start of the season. The annual A-U Pre-view begins today and will come at you daily until kickoff, along with the remaining Cheese Puff Previews, Google surveys … posts (most of them), and entries in the “5 to Root For” series. Buckle in; WBE is going to be comin’ at you fast and furious these next two weeks. Any one see that Herbstreit picked us to win the West? So much for flying under the radar. Maybe it is still a hangover from 2004, but I sorta feel like Herbie is doing that just to mess with me. Doesn’t he know how we deal with elevated expectations? That’s why I was wasn’t overly thrilled to see Cam talking to the press about not being mentioned enough. I’d rather read boring quotes about how “we’ll just show folks on the field”, or “Just wait and see”- -type stuff. At any rate. I can’t believe we are T-minus 2 weeks from the start of real football. I’m looking forward to the blitzkreig of posts, Jerry. got turned onto this site by a shout out from my friend Will Collier and I have to say that I absolutely LOVE IT! Welcome home and thanks for the great insight. Eh, I think Auburn’s still pretty well under the radar. The Corso comment came at some luncheon; Auburn fans are the only ones who seem to know he made it. The Herbstreit prediction is a little higher-profile, but he also just called Georgia his big SEC sleeper–go figure–so I don’t think it’s a big deal. The real measure of preseason hype is the polls–and Auburn comes in a healthy fifth or sixth in the SEC in both. TakeEm, glad you like the site! Stick around, the season’s going to be awesome. Welcome Back Jerry. Dont like it when I cannot read an update from you everyday. On the ankle injury…I noticed before that Bitter posted a picture of Phillips the other day from practice and he did not have tape on his ankles….Does it not seem like all skill player should have their ankles taped at all times? Just seems like good insurance. WDR, particularly those who weigh 290 pounds, I’d think. It can’t be easy to cut when you’ve got that much … inertia. If that did have anything to do with it, I’d imagine that’ll be the last time they’re NOT taped. Thanks for the updates, Jerry. To update those who were around on the signing day LiveBlog: I’m currently at Ft. Benning and heading to Kosovo in the next week or so. Y’all pull the Tigers through for me. I should still have excellent internet capability over there, so I’ll chime in on here as I’m able. And if I can find a way to get a picture involving some Kosovar ping-pong, it will be sent immediately. WDE! God Speed Walt! Hey WBE, I say it’s time we starting embracing whatever expectations come with being great in the Chizik era. The future looks bright (I do have AU sunglasses though), WDE!